Jazz, 13th Edition, offers a comprehensive study of the history and cultural development of this rich and powerful musical world. Students will enhance their musical experience further by studying the historical roots of the jazz culture in America, and following its development over time to more modern influences. 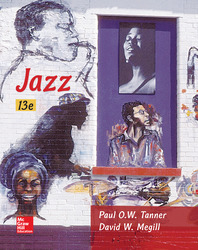 This text follows the historical arc jazz takes from its early stirrings to the mature art form it ultimately becomes. It focuses on the uniquely American blending of the African American oral tradition and the literate compositional tradition typical of Western Europe.